DIY kits for installing this mod are available HERE. 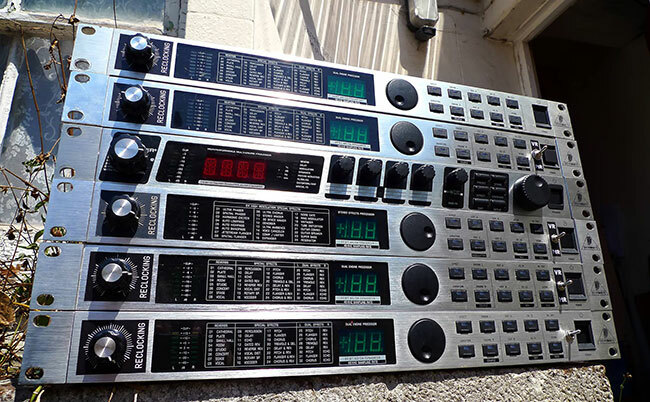 The Behringer Virtualizer DSP1000 was first released around 1997, closely followed by the Virualizer DSP1000P and Modulizer DSP1200P a year later. The P appears to stand for 'Pro'. The only difference we can discern between the Virtualizer DSP1000 and the DSP1000P is that the Pro version has XLR inputs and outputs alongside the normal jack sockets, and the non pro version doesn't. There may have been a non pro version Modulizer, but we can't find any trace of one. The Modulizer appears to be a much rarer beast, as demonstrated by the fact that at any given time you can probably find a couple of dozen Virtualizers of various different types on ebay, but you'll rarely even see one Modulizer. 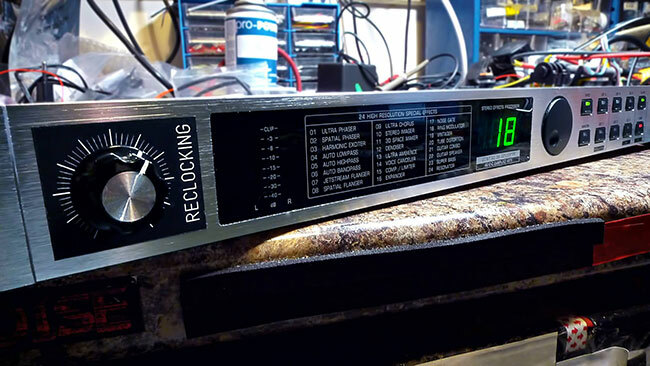 A couple of years after the Pro versions were released, Behringer updated both units to the DSP1024P and the DSP1224P. The only improvement seems to have been a upgrade of the D/A and A/D converters from 20 to 24 bit, as if anyone could possibly tell the difference on a late 90's Behringer machine! The Virtualizer has two effect engines with either stereo or dual mono effects including all the standard reverbs, delays, chorus, pitch shift etc that you would expect on a cheap multi FX, but it also has a few more unusual effects like vocal distortion and what someone at a Behringer lab somewhere might imagine was a vocoder. This sounds like the work of someone who'd had a vocoder described to them, but had never actually heard one! The Modulizer has an altogether more interesting but baffling array of effects including various phasers and flangers, auto lowpass/bandpass/hipass filters, ring modulator, vintager (what? ), resonator, guitar amp simulators, and the curious 'ultra ambience' and '3D space maker'. 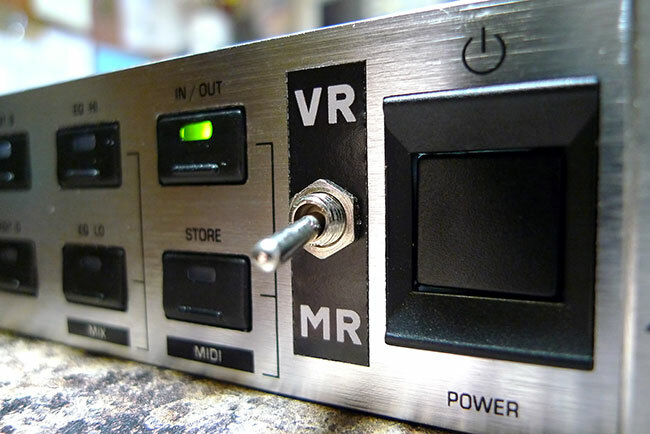 You get the impression that Behringer ran out of ROM space in the Virtualizer and thought they might as well put out another unit with all the stranger stuff in it! This might go some way to explain why the Modulizer plainly didn't sell so well and it correspondingly rarer second hand. 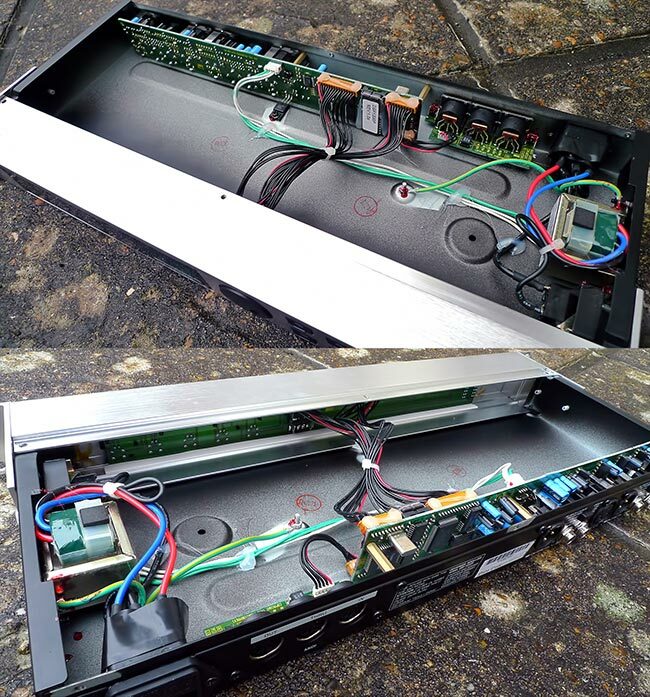 When you open up a DSP1000, DSP1000P or DSP1200P you'll find......... nothing! Seriously, theres nothing in there. Theres absolutely no reason for the case to be that deep as at least 75% of it is empty space. You have the control boards at the front, then about 5 inches of nothing, and the sockets board at the back. The actual effects processor is a small cluster of IC's and an operating system EPROM at the back of the board. The DSP1000P and the DSP1200P are identical inside apart from a different operating system EPROM. As they are the same machine, this gives us the opportunity to copy the OS from both the Virtualizer and the Modulizer, and then write them both to another EPROM with twice the memory. With the addition of a small adapter PCB and a switch we can then mount both operating systems in the one unit and make it switchable between operating as a Virtualizer or a Modulizer allowing you to use the effects of both units. 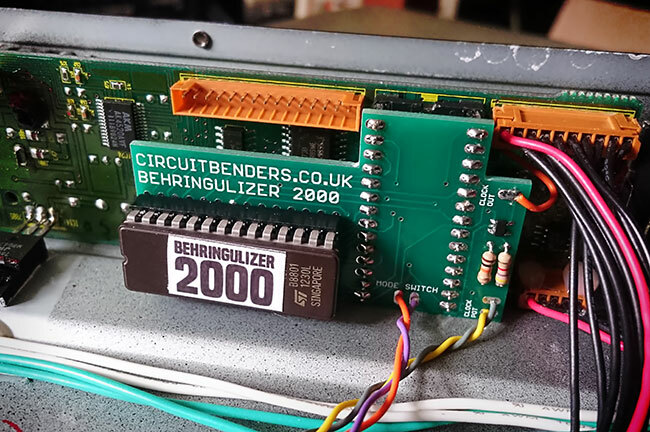 BEHOLD, the birth of the Behringulizer 2000! You have to make the switch between versions with the unit turned off to reboot the OS, or else it tends to crash wildly! We would have thought that both the Virtualizer and Modulizer operating systems would use the same memory areas to store saved user presets, and so any saved effects would be scrambled when you make the switch due to the effect parameters of programs saved in certain positions being different, but mysteriously this is not the case. Possibly this is a legacy from when Behringer were designing the operating systems and it was easier to use different memory blocks to save effects for each OS, so you could use the same hardware to test both systems. Whatever the reason, it means that you can now use one unit as both machines with completely editable and savable preset effects. This OS switching mod seems to work fine on the DSP1000P and DSP1200P, but while it works to a certain degree on the original DSP1000 for some reason some of the effects have a certain amount of distortion apparent, especially the reverbs. We aren't sure why this is the case. We have not yet tried this mod on a DSP1024P / DSP1224P and don't know if they use the same operating system arrangements. The other mod is a reclocking knob as found on many other machines we have modded. Essentially this removes the onboard system clock and replaces it with a variable clock controlled by a knob on the front panel. This means the processing of effects can be slowed down or sped (or is it speeded?) up at will. It will extend the reverb and delay times to a grungy degree way outside of what would normally be possible. Reverbs can be altered from short metallic ambiances to massive washes of glacial disconnected sound just by turning the knob, while the speed of the delays can be continuously controlled and wildly pitched up and down at will. Some of the best reclocking effects can be created using the stranger presets such as the ring modulator, vocal distortion, and vocoder. Literally playing the reclocking knob while these effects are active takes them well out of their safety zone into something more organic and deeply unpleasant. Theres something strangely satisfying about the way all the LED's start strobing as their update flash rate which is normally far faster than the human eye can see, is pulled down into visual frequencies by the reclocking. All the components for the reclocking mod are found on the new OS switching PCB, so installing the mod is a simple job of removing the original timing crystal and replacing it with the clock output from the new board. Connect up a pot and enter a new world of nauseating digital noise! We have managed to successfully perform the same mod on the Virtualizer DSP1024P and Modulizer DSP1224P. The 1024P and the 1224P do actually have different operating systems to the normal 1000p and 1200P versions, although mysteriously while they use OS EPROM's that have twice the ROM capacity as the previous versions, this is only because exactly the same OS data is repeated twice on each EPROM! Essentially they use half the ROM capacity for the operating system, and then use the other half to repeat the same data. Presumably at the time these units were produced it was just cheaper to obtain the double capacity EPROM's rather than the obsolete smaller ones, although that does beg the question of why they were still using EPROM's at all in 2001/2002 when these units were produced! The reclocking mod also works on the original Virtualizer DSP1000 machines, but for some reason attempting to use an operating system from either of the DSP1000P or DSP1200P models in one of these early non 'P' machines seems to cause some strange digital noise and crackle on the reverb effects, making them more or less unusable. This suggests there must have been more changes than just the addition of XLR inputs and outputs when Behringer upgraded the design to the Pro versions. Reclocking also works fine on the later Virtualizer DSP2024P machines (are you sick of reading 'DSP something something P' yet? ), but there was only one version of these units with most of the effects from the previous Modulizer and Virtualizer models already onboard, so you don't need to do any EPROM mods to get the full range of effects.